In our house, the birthday kid wakes to a table decorated just for him. This tradition doesn't cost a cent, but it always produces that little gasp of surprise. A blue-and-green gift arrived in the mail, so we pulled out all our blue bags and paper for wrapping. All the fluff makes even modest presents seem grand. We spread a blue fabric remnant and hung balloons from the chandelier. See how extra balloons fill gaps between presents? I scatter sweet candies and sweeter memories in the empty spots. We were all so sick, I let Andrew make his own cake and decoration the day before. Don't hate me, but I also made him wear a spring green shirt. Me, micromanage the details? It looks better for the pictures. I feel bad that he was sick on his birthday and that his party had to be canceled after all his work on his candy launcher (or whatever that great invention was). I hope he enjoyed the festivities with the family anyway and was able to enjoy a piece of the cake. Were there candles? What kind of cake did he choose? Great idea, Meredith. 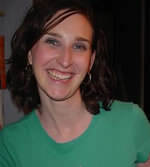 I "stole" a fun and frugal birthday idea from a friend of mine - the night before each child's birthday, I decorate the kitchen cabinets with photos of the birthday kid - from birth onwards (the only exception to this is for our 9 year old son, whom we adopted at the age of 7 - for him we add as many pictures as we can find, and other mementos like Ethiopian money and the Ethiopian flag). The kids love their birthday "photo gallery," and we usually keep it up for a week or so afterwards. The pictures came out kind of dark because this was 5:30 in the morning before his dad left for work. We just had the cake at home and no party with friends. He was really so sick, he didn't even care. MEREDITH! I love the idea of scattering memories around the table. What a fabulous idea. We keep these treasures but rarely look at them. Why not pull them out every year!? My oldest is turning 5 (gulp) in April. I am going to do something similar! I also love Kate in NY's idea of the photo gallery. And I have plenty of time to pull that off as well! The year my dd turned 2 her birthday cake was probably the worst. I was in the dog days of pregnancy w/her brother and I could barely stand to be around food let alone ice a cake. At 2 she was none the wiser (well about the cake looking pathetic that is). On her 4th birthday I made a great looking pig cake and SHE was too sick to have her party or enjoy her cake. I like the idea of decorating w/memories...kids love to see stuff from when they were babies...pictures, clothes, toys, books. Love the pictures, Meredith. 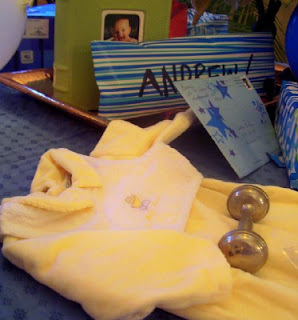 At first, I thought, "Why in the world did they gave Andrew baby clothes and a rattle for a gift?" Then I realized it was a baby Andrew memory---love the idea! Hey, it's OK to color-coordinate his clothing for the pics, too. For my son's first five birthdays he wore an outfit that went along with our "theme": Elmo, Blue's Clues, Bob the Builder, etc. Happy Birthday to Andrew! Sorry poor fella is sick. The cake topper is absolutely wonderful. My husband is a LEGO fanatic, so I truly appreciate LEGO works of art. How many kids get to make their own birthday topper? That is so cool. My mother used to do something similar. Used to... Heck, she still does it, even though we're long grown up. LOL! How absolutely wonderful! It is so appealing to see all those things, "just for you" on the big day, I bet he loved it. And I loved the other link! I am in love with you! YES to the fabric remnant--don't you always say--but I just know I can use this again! YES with the color coordinating! double YES for the Memory Stuff on the table What a GRAND idea! I will most definately be copying that one as soon as possible! Triple YES to the lego cake topper! He might just remember that one forever! I would love to have birthdays in your house! What great memories you are creating! This is our tradition, also. It IS so much fun to see their little faces at all those gifts! It all looks beautiful. I hadn't thought of getting out the baby clothes. We get out the baby book, but hadn't gotten that far. Great idea. And I totally get your clothing dictates. We always dress for photos. Ridiculous in some ways, but they always look nice. That is such a clever idea- I adore it! I am going to be stealing this one for sure! I haven't been to your blog for a while. Looks like you've been busy. Love the 'birthday table' idea...btw-My boys would LOVE to make their own cake decoration! Meredith- it's been a while since I commented, but I am a faithful reader. Somedays if I only have time to read just a few blogs, yours is definitely one I must check. Anyway, I love this fabulous idea! The photo gallery idea is great too! How fun to wake up to that! Now does he get to open his presents right away in the morning? Lucky boy! I hope he has a fantastic birthday! I LOVE this idea and I am definitely going to start doing this for my kids. What a fabulous and easy way to make them feel special! What a wonderful way to make a birthday extra special. Thanks for sharing this great idea! This looks wonderful! Too funny on the shirt color. I would never be able to put my daughter in an outfit of my choosing. Glad he played along. Andrew did a wonderful job decorating his cake. 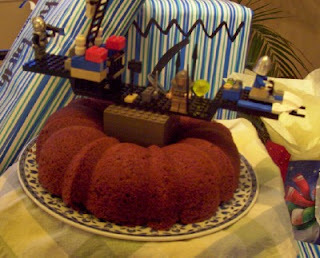 Lego, children and cake the perfect combination. Thanks for giving me an excuse to use this cute phrase: I love this to pieces! In our house, the birthday person gets their presents brought through to their bed, then gets to have breakfast in bed. Even the dog used to be allowed up to join in the excitement, though he got confused and can't tell the difference between birthday and regular day, so now he has to stay on the floor. I love that the birthday cake was already on the table ready for the Birthday Boy! If it is your birthday, then I say "Let him eat cake!" - and whenever he chooses! I feel so bad that you all are sick though! The flu has been really bad in Wisconsin - I don't know if it is the same in Tennessee, but this year it isn't just the respiratory gunk, it is also the stomach flu at the same time! Talk about adding insult to injury. What a fantastic tradition! LOL--I just let my four year old decorate his own cake too! He did a gread job and has even offered to make my cake when my birthday rolls around! I really like this idea! I don't have kids but this is still a great idea... for later! Plus, I wanted to say that i have really been enjoying your website lately!! I have read back into your posts and you have some awesome ideas for this & that i've really made notes of for myself for a later date to use. Keep blogging! What a beautiful idea for celebrating! Thank you for sharing! We do this too! I always fill up the dining room table for the bday kiddo the night before and pile it up with presents, cards, decor(our girls always get flowers for their bdays) balloons, etc. 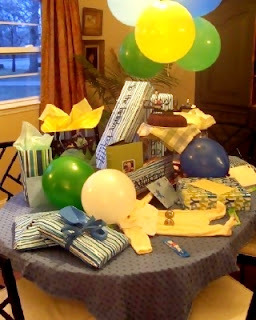 How fun his table looks! MY 6 year old just saw the picture of Andrew's cake and he thinks it's really cool.